The latin term, clipeus is often used by modern historians to describe the flat oval shield carried by the Roman auxiliaries. However, this is not appropriate. The Roman applied the name clipeus to circular shields such as those carried by the ancient Greeks. 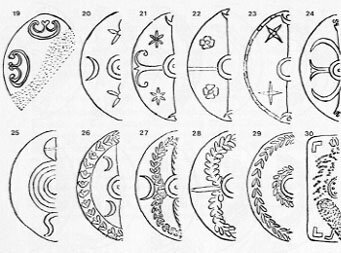 Scutum was the general latin word for "shield," but there does not appear to be a specific word for the oval shields used by the auxilia. Numbers 1-4 were probably units granted Roman citizenship for valor. 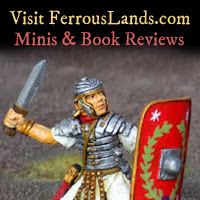 4-8 were units raised from Roman citizen volunteers. 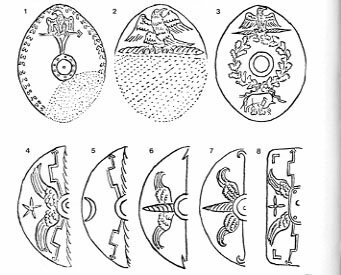 He bases this hypothesis on the fact the these shields show Jupiter's eagle and lightning bolts—just as seen on the legionary scuta. 9-18 Are shields probably from units that were awarded the title torquata. 19-30. Various auxiliary designs. Note the rectangular shield carried by an auxiliary (30.). Rossi thought this had special significance, but it was probably just an error on the part of the sculptor. 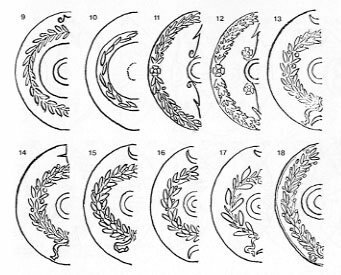 The wreath design is very common on auxiliary shields on Trajan's Column. A wreath (or cown) was awarded to a general who retuned from battle with victory. There were also a number of military decorations awarded as crowns. It can be guessed that whe this design was painted on a shield it meant that particular unit had recieved an award for some great victory. 2. Rossi, Lino Trajan's Column and the Dacian Wars.